It’s not enough to have a beautiful sunset, you need something beyond just the sun and the sea. Here I experimented with radical backlighting. Because I was using slide film, the blacks are very black, but I really like the end result. I had to do a bit of illegal trespassing to get to the Makapu’u Lighthouse although unlike others I didn’t risk my life scaling the cliff to get there. The sight was well worth it though, perched as it is in the rocky shores of Eastern Oahu. I felt like a wide shot was a good way to do it justice, and in any case my digital camera had run out of battery! 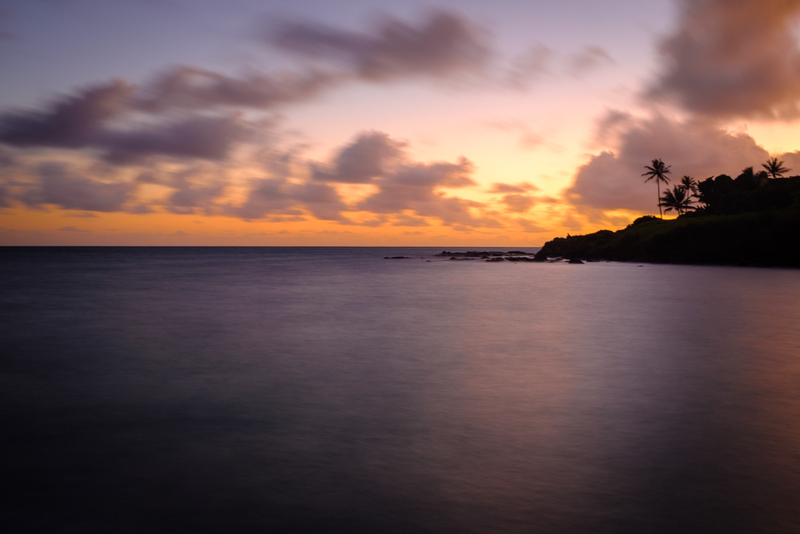 After what I felt to be a dissapointing sunset in Hawaii, I didn’t pack my x100f for the next evening but had my XPAN with me with a roll of Redbird which I hoped to use for « street » on the beach that morning. Of course the sunset turned out to be spectacular, so I shot with what I had. Most of that Redbird roll turned out to be way too grainy, probably because despite rating at 400 ISO it doesn’t deal with low light all that well. There’s only one shot that’s not too grainy, but thankfully it’s pretty spectacular, and it’s the one above. The minutes before dawn can be bland, or they can be fantastic. When there are clouds and the sun is just about to peek above the horizon, you often get marvelous colours, as it was that morning in Hawaii. 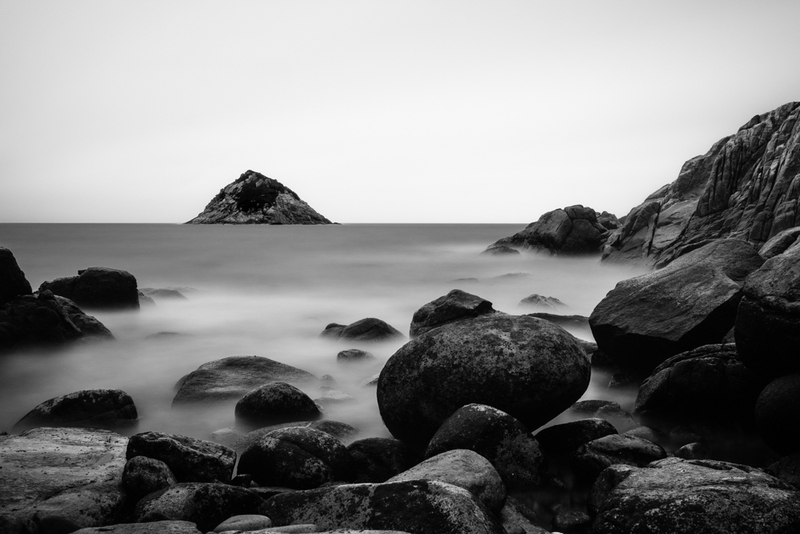 I decided to try this very sparse composition with lots of featureless sea due to the long exposure, and I find it very soothing. It was the boulder that attracted me to this composition. 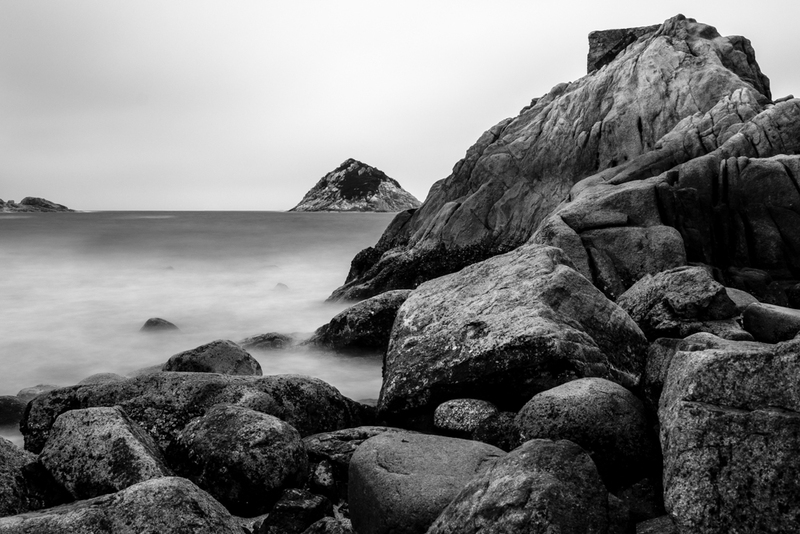 I love the way the waves at the forefront look like mist over the rocks, and I think the round boulder and the pointy island balance each other out nicely, compositionally speaking. To say that our summer in Wellington a little over a year ago was worse than most winters in France would be an understatement. 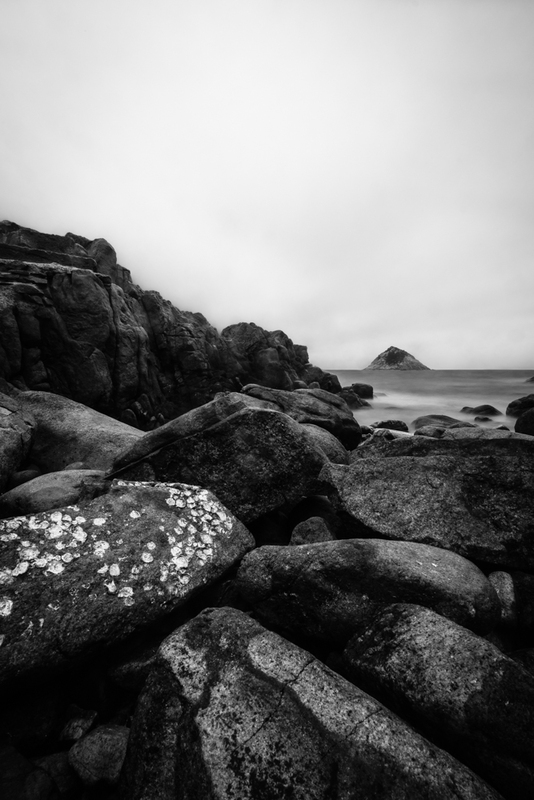 But I got dramatic skies and heavy grey light, good stuff for long exposure black and whites by the sea. I only published one shot from this series previously, and when I revisited it this one struck me as really interesting. When it comes to composition, the effects of wide angle on how things sit in the frame is interesting and an opportunity to play around with things. Here the island that was maybe 500 meters from the shore looks really far away, and the rocks at the foot of my tripod look massive. And this was just 15mm, imagine at 10mm !!! I got up really early on a Sunday morning to catch the sunrise on the Southeastern side of Hong Kong Island. The weather apps said it was going to be a sunny day. Even before I got to Shek O, I knew that would not be the case thanks to the drizzle on my windshield. Weather is not an exact science. 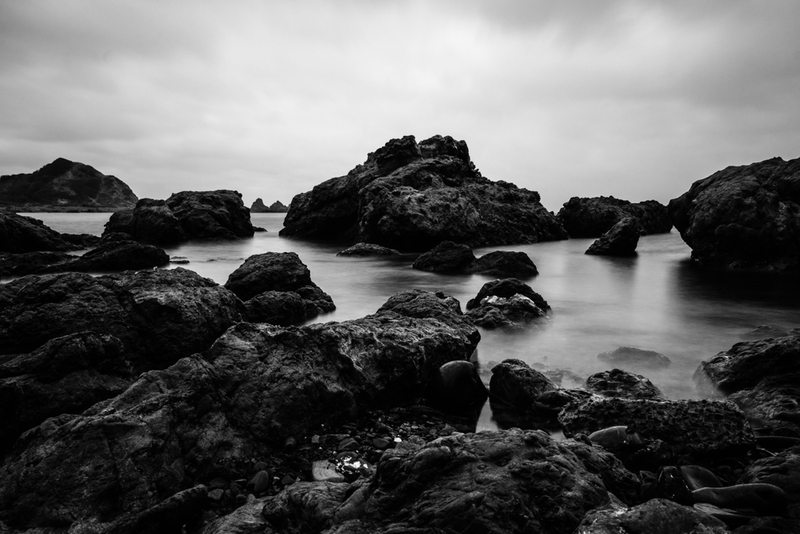 But when life gives you lemons you make lemonades, so I shifted from glorious colour sunrise over sea to moody black and white over rocks. I got three good shots out of it, this one is the first. 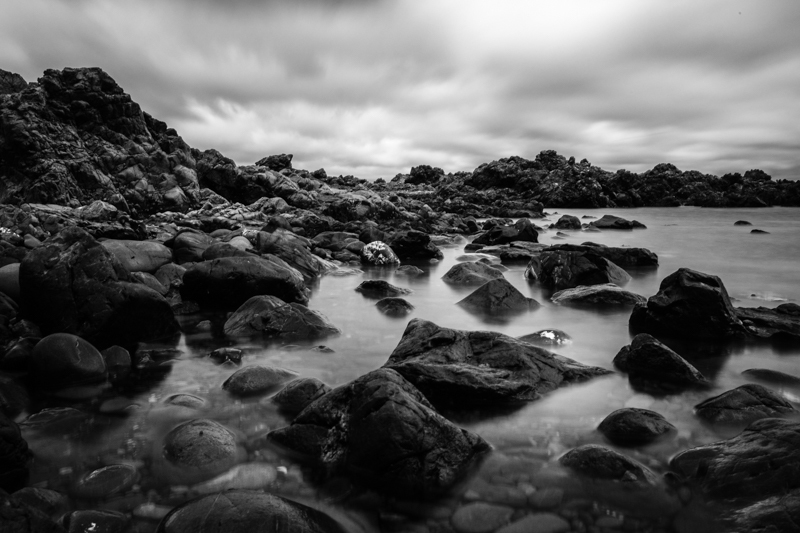 I know this doesn’t look exactly like the best holiday weather (and it wasn’t), but you make the most of what you have, and I definitely like this haunting long exposure of the fractured rocks by the Cook Straight in Wellington. 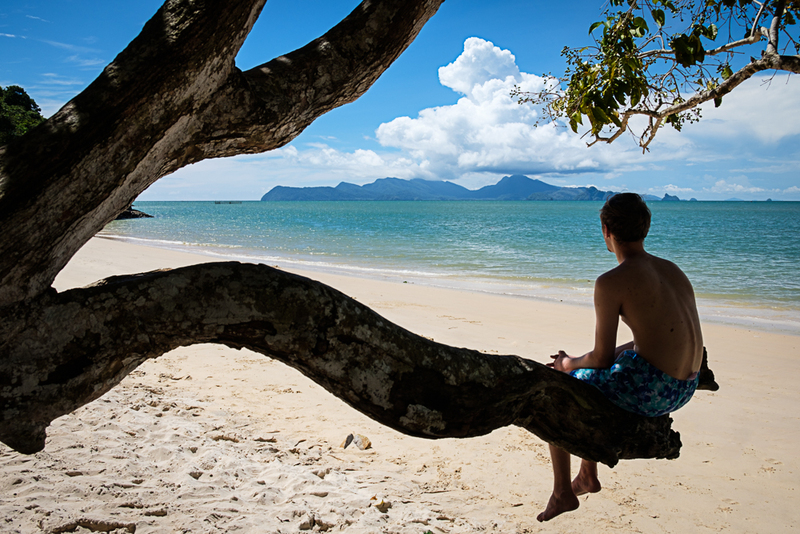 As soon as I set foot on Pasir Tengkorak Beach on the Northern shore of Langkawi I knew I had to take a shot using those two branches to frame the island out at sea. I did several attempts, but the photo was missing something, I felt, so I asked my son to sit on the branch. I think this balances the composition nicely.